This summer, my next door neighbor and I decided we would exercise together 2 or 3 times a week. Morning was the best time to workout for us since it was still cool outside. Since her kids are little and might be a bit frightened if she was not there when they woke up, we exercised at her house. The first few times we exercised, I went through her front gate but that usually meant waking up the guard (who was probably suppose to be awake anyways) or my friend having to come down to let me in. To avoid all this, I decided I would go over the wall between our backyards instead. The kids do it all the time. So why not me? The only thing is that I don't like heights or ladders. 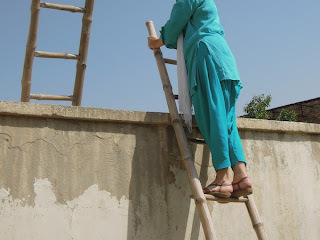 (To see why I hate ladders click here ) So with a little fear and trembling, I cautiously climbed up the ladder one rung at a time. Then I carefully transferred from one ladder to the next and made my descent. I did it. It felt good and in a strange way gave me a sense of independence. After exercising, I decided not to press my luck and exited out the front gate to get to my house. There was no need going over the ladder twice in one day. Now summer is almost complete. I can now go over the ladder both ways often with my water and exercise mat under my arm. No head scarf or coat needed. Once or twice I have even had to be a little creative when the ladder on the other side was moved. It is funny how a little thing like climbing over the wall can make me feel more independent. Life is often like climbing over the wall. We take each rung or day one at a time. Each thing God calls us to do we take one step at a time. Sometimes we are overwhelmed by the big picture, but when we take the first step it doesn't look quite so daunting. Looking at my classroom yesterday, I tried not to feel overwhelmed at the amount of work that needs to be done. I decided to take the step of getting the bookshelf dusted and back in order. Two hours later all the books were in their proper place and I had started sorting through a box left by a previous teacher. Now those kind of rungs or steps, I can handle. I am task orientated person. Put me in a room of people and I can be a bit overwhelmed. In fact today, the kids and I are going to school to help serve breakfast to the new teachers. Yikes. Meeting new people ranks right up there with heights and ladders. So today I am going to concentrate on taking one rung at time. I will focus on one teacher at a time praying that God sends me to the ones that need a new friend the most. Who knows what adventures are in store for us this year? I will never know if I don't take the first step. What rung or step are you needing to take? What helps you tackle those things that you are procrastinating or afraid of? "One rung at a time." I love that. This is a great reminder to take small steps. I need to get myself organized for homeschool (including going through a chaotic closet and organizing, which I do every August.) Today I turned on a timer for 25 miutes and tackled the closet. Will do more tomorrow. I agree with OliveTree, and I'll start my timer and begin the first homeschool organization step after work today!